In the hyper-competitive Amazon marketplace, diligent FBA Sellers are always looking for an edge on the competition. Hyper-competitive being an understatement here. Between new Amazon reviews regulations, long-term storage fees updates, recent account suspension horror stories ( and this is just a tip of the iceberg)- you might have lost some perspective on the upcoming deadlines. As we have entered the most profitable month for sellers, it makes sense to double check all the most relevant dates. But, in this article we will not focus only on Q4, but on every single date that should matter to you as a seller throughout the entire year. Your Amazon FBA Sellers Calendar should cover sales and marketing activities for the entire year relating to holidays and special sales events. Whether you are selling in the US or are selling internationally on Amazon, this will enable you to have a steady stream of sales on a month-to-month basis, while maximizing sales during peak times in the marketplace. By using an Amazon FBA Sellers Calendar, you’ll be ready with marketing promotions, giveaways, and sales from New Year's Day to New Year’s Eve. You’ll always be organized and prepared, with plenty of stock on hand and seasonal goodies to appeal to your target customers. If your local brick & mortar retailers are doing it, so should you. One of the advantages you’ll have over them are the additional online sales holidays and events, like Prime Day, which are outside the traditional gift-buying celebrations like Christmas. Whether you’re selling FBA in the United States, Europe, or China, we’re going to break down the special days you need to be aware of. 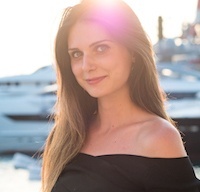 Be sure to add these to your marketing strategy in order to take full advantage of the additional customer purchasing power that comes with holidays. As a bonus, we’re going to tip you off to 6 under-the-radar event days that can help you grab an edge with sales in your niches. It’s time to break out you calendar and prepare for a sales bonanza. Let's first start with what's around the corner- the most important dates of the last quarter. “Christmas last post” - The last day people can order and still get their deliveries in time for Christmas via Amazon Prime. Amazon announced a special deal for sellers who want to launch a new product for Holiday Season. They clearly want to encourage sellers to launch brand new products with the goal of expanding selection on its site. Amazon is offering participating FBA sellers reimbursement for up to six months of long-term storage fees for new-to-Amazon ASINs in qualifying categories created between August 21, 2018, and November 30, 2018. The inventory must be received at a fulfillment center by December 5, 2018 in order to qualify for the promotion. Categories that qualify include Apparel, Collectibles, Crafts & Sewing, Jewelry, Home & Garden, and Toys & Games, among others. Amazon is excluding the Media category. Now that we covered Q4- let's take a look at the bigger picture. While there are a number of helpful holidays for sales during the calendar year (which we’ll touch on in a bit), there are 4 times when it’s particularly important for Amazon FBA Sellers to be on top of their games. We mentioned them above, but let's share some more details. Amazon’s biggest global sales event is 1 ½ days of terrific deals exclusively for Amazon Prime members. if you have prepared accordingly and came out of the craze with cracking sales, you must still recall the sellers' high a few months ago. If, not there is always next year. Usually the date falls in mid-July, and is announced by Amazon a few weeks prior. The thousands of limited time deals are offered only to Prime Members, but there’s an option for others to join the sales through free one month trials of Prime. Sales are 60% higher on Prime Day, so be sure to plan ahead accordingly so that when the date is announced, you are already prepared. This year, Amazon Prime Day lasted for 36 hours and the the members purchased more than 100 million products worldwide and surpassed all the prior sales record. Falling on the day after the American thanksgiving holiday in November, this was a traditionally big day for brick & mortar retailers to begin their Christmas shopping specials. In recent years, the sales push has moved online, where customers can shop from their home instead of navigating crowded shops to find bargains. The same kind of deals can be now offered online, making it a winning day for sellers and buyers. 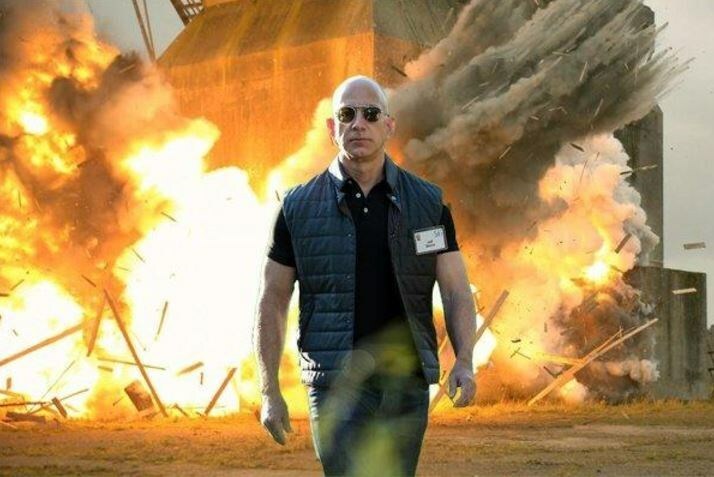 After last year's Black Friday- Amazon shares hit the highest record up to date which brought Jeff Bezos to a 12-figure fortune ( and now on the Forbes throne as the richest man in the world). Fun fact: The earliest known use of "Black Friday" term was in the journal, Factory Management and Maintenance, back in November 1951, and again in 1952. It referred to the practice of workers calling in sick on the day after Thanksgiving, in order to have a four-day weekend. Around the same time, the terms "Black Friday" and "Black Saturday" came to be used by the police in Philadelphia and Rochester to describe the crowds and traffic congestion typical for the start of the Christmas shopping season. The Monday following Thanksgiving is it’s own online shopping holiday, with tons of deals on Amazon in electronics, toys, books, and video games. It was the biggest sales day for entrepreneurs and small businesses selling on Amazon in 2017. The entire 5 day period following Thanksgiving resulted in 140 million customer orders. While not as big as Black Friday, Cyber Monday offers a great opportunity for additional sales and promotions to kick off the Christmas shopping season. American schools generally begin their year at the end of August and beginning of September. For FBA Sellers, this means the end of July and all of August are great opportunities for selling school supplies, textbooks, clothes, and other items needed by kids from kindergarten age to college students. Whatever you’re selling, tweaking the marketing towards students is a great way to take advantage of the season. Parents and students are both doing the shopping, and everybody can increase their sales during this time. 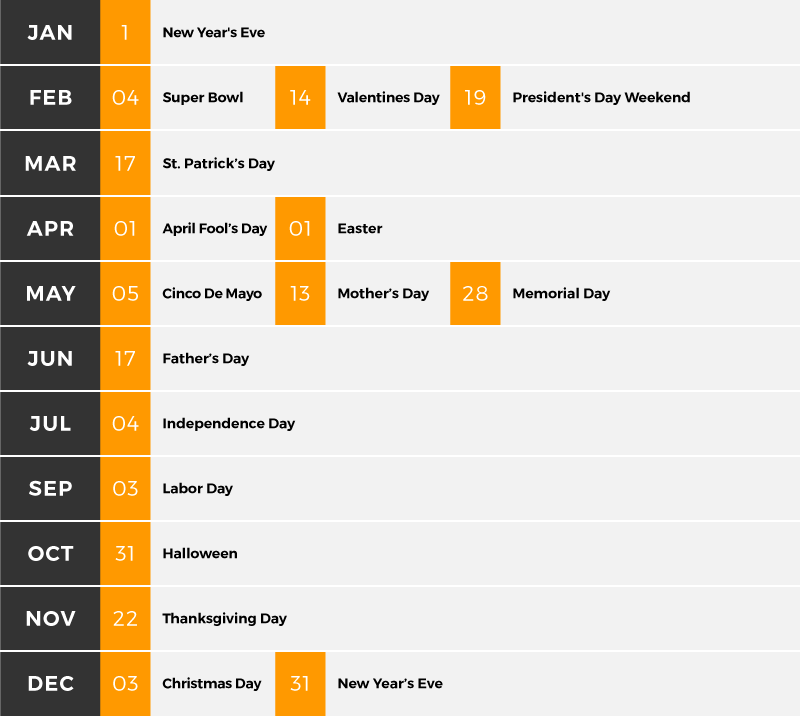 Be sure to add these holidays to your calendar, and check the dates as some of them move around the calendar by a few days here and there per year. We’ve also included a few helpful ideas for sales items related to the holidays, or that traditionally go on sale in that time. Europe is rich in festivals and holidays. For Amazon sellers in the EU, many holidays are shared with the US. Each country has its own national or republic day, of course, as well as the seasonal holidays. We’ll run down the dates of the holidays here, and in general you can use the suggestions listed for US holidays as ideas for sale items in Amazon.eu shopping. No matter which country you are selling in, there’s plenty of opportunities to increase your Amazon Europe sales with this Amazon calendar for Europe. Be sure to note that while some holidays are the same in the USA and the EU, they may not be observed on the same date. We’ll helpfully mark those holidays with an * for you. 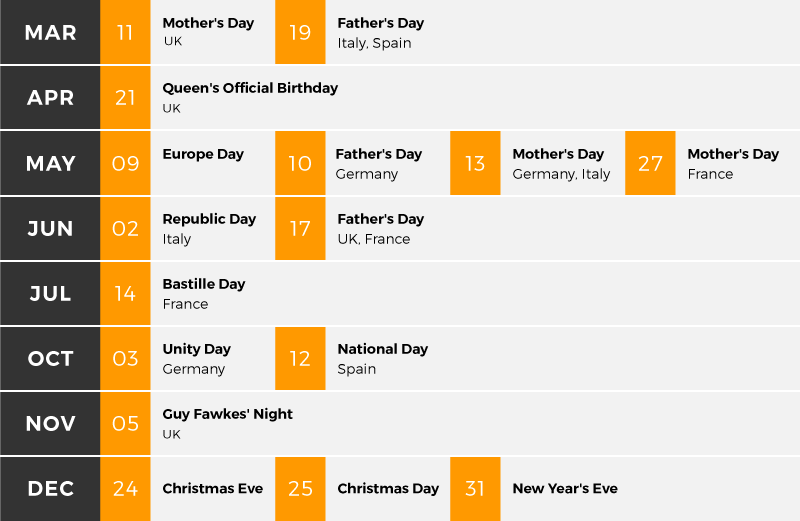 Holidays celebrated in the entire EU are indicated in bold. June (third Sunday) - Father's Day in Bulgaria, France, Ireland, Malta, the Netherlands, Slovakia, Switzerland and the UK. Chinese holidays are very important as an Amazon FBA Seller anywhere in the world. Well, your shipments of goods from China can be seriously impacted by delays due to Chinese holidays and festivals. It’s really important to keep these holidays on your calendar if your products are sourced from China in order to minimize the time it takes to get your shipment. Celebrated on a variable date depending on the lunar cycle at the end of January and/or beginning of February, Chinese New Year could seriously impact your business. This because there are traditionally 7 days off around the holiday. Many other countries in Southeast Asia such as Singapore, Hong Kong, Taiwan, Indonesia, Malaysia, and Thailand observe this holiday too. You will be unable to place any orders for a week during this Lunar New Year celebration time, so plan ahead so as not to get caught short-handed on stock. This is also known as National Golden Week, a huge holiday celebrating the founding of the People’s Republic of China. It’s another weeklong celebration with 7 days off. The Chinese enjoy family time, fireworks, and parades during their week off work. As suggested above, plan ahead to avoid needing a shipment during this time. China. Plan accordingly to keep your customers happy and the sales flowering all year around. Thanks to the magic of the internet and creative marketers, there are a number of other “holidays” you can celebrate during the course of the calendar year that will really help your sales, especially if you are in the right niche. These are great opportunities for sales, giveaways, coupons, contests, or rewarding loyal customers. We’re going to share six of them with you here. Take advantage of these “holidays” to increase your sales and serve your customers with special deals like gift cards, discounts and more. The key to successful selling all year long on Amazon is being prepared. Use this information to create your own Amazon FBA Seller's Calendar designed especially for your business. With a bit of planning, you can capitalize on holidays and the added sales they bring all year long. Not only that, your customers will appreciate your thoughtfulness. It’s truly a win-win for everyone. Set up your Amazon FBA Seller's Calendar today and make this your best sales year yet!